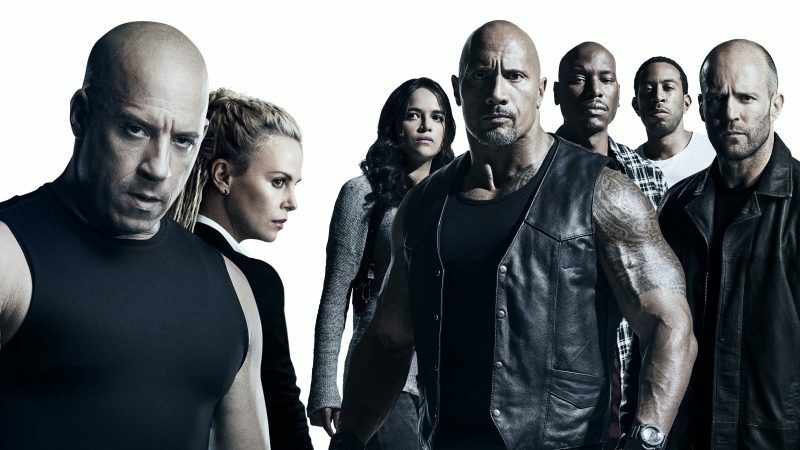 "The 8th Installment of the Fast and the Furious Franchise Continues to be Dumb Fun"
The Fate of the Furious is the 8th installment of The Fast and the Furious franchise, this time directed by F. Gary Gray and starring once again Vin Diesel, Michelle Rodriguez, the Rock, Jason Statham and newcomer to the series Charlize Theron. Dominic and Letty Toretto are happily off the grid on their honeymoon, when Dom meets a mysterious woman (Theron), after a few moments of small talk the women reveals that she knows exactly who Dominic Toretto is and she needs his help. Soon after, Special Agent Hobbs (the Rock) is approached to return to duty become it has come to light that Dom has been spotted committing acts of terrorism. Hobbs obviously cannot do the job alone, so he recruits the team to find out why Dom has gone rogue and bring the proper villain to justice. There is really not much to critique in the Fate and the Furious, except how much more ridiculous each entry in this installment in this franchise seems to get. And yes, the 8th one succeeds with flying colors. It is an overblown action movie with an A -list talent, enormous budget, with a script that parodies its own films. The Fate and the Furious is dumb, but it knows that its’ dumb and has no problem letting the audience know that its’ dumb. It is the movie’s biggest strength, and as long as you as an audience member are on board, you will have a good time watching this movie. The Fate of the Furious other two strengths are its characters and its action scenes. The heist team, (the Rock, Tyrese, Ludacris, and Nathalie Emmanuel) or the family, as Dom calls them (for a total of 16 times) are utterly charming. They’ve worked together for several movies now, obviously know each other very well, and they’re all about having fun and it shows every time they are on screen. Due to Vin Diesel not working with the team very much, the Rock takes over as the de-facto leader of the squad, and when he’s around you don’t miss Vin very much. He settles right into the role. And finally, Jason Statham, the main villain in The Fast and Furious 6, comes back here as a good guy. And honestly, he is the highlight of the film. He and the Rock have great chemistry in their jail scene together, he has a scene with Helen Millen that is downright hilarious, and he is a huge part of the third act and his charm leaps off the screen. The action scenes are so unbelievable is in this film, its’ laughable, but still highly entertaining. There is a scene where Charlize Theron character hacks every self-drivable car in New York in order to trap a government official to hand over nuclear codes. 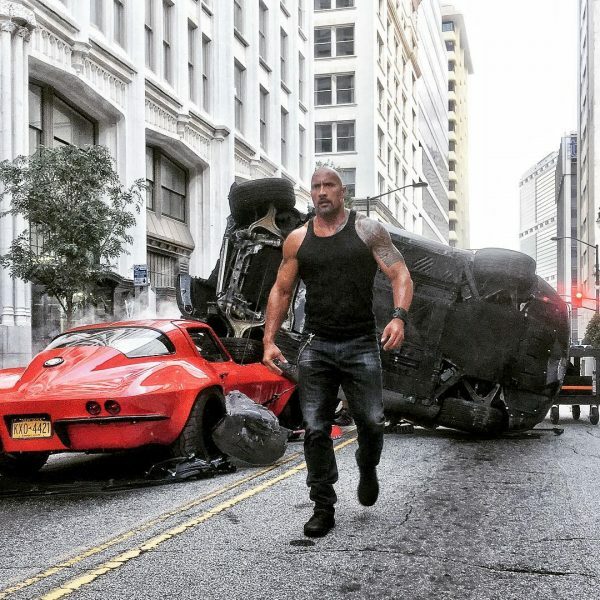 Cars are driving off buildings, they are chasing the team off the road, it’s a little surreal to watch because it doesn’t really have a point in the script, but it’s refreshing to see an action set piece placed in a film of this caliber that is obviously there solely for entertainment purposes, or maybe even something cool to put in the trailer. And that’s only one, of many scenes like this. The only flaw that I had with The Fate of the Furious is there a little bit of a slowdown in the second act, which normally I would have a problem with, but in a movie like this scenes like that really stick out like a sore thumb. Overall, I recommend The Fate of the Furious, it’s a good time. As long as you go in not expecting any Academy Award winning performances, its’ really hard not to have a good time with this franchise.